RESTRICTORS AWAY IN JUST ONE DAY! 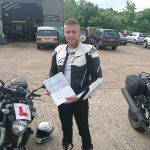 No more restricted licence for Max Pearce now he’s passed his accelerated access with just one day recap – marvellous delivery Max!!!!! So after a couple of years gaining road experience he sailed through both mod1 & 2 and was a ‘free man’ by the afternoon – he deserves w show of hands!